Review: Sam and Frodo are still on there way to Mordor to destroy the ‘One Ring’. At the same time all of Sam and Frodo’s former companions make new allies and make an attack on Isengard. This film is the weakest of the three. I felt that there wasn’t really any purpose for Legolas. I don’t remember him doing much or appearing much in this one. All of the dead horses that can been seen at the end of the battle scenes all made of polystyrene. Peter Jackson wanted Andy Serkis to be down for best supporting actor at the Oscars but because he wasn’t actually seen in the film the Oscars said no because it was against their rules. This is one of the films that was gross over $100 million in the first week which was really rare for a film to do. Gollum says the word ‘Precious’ 15 times in this film. 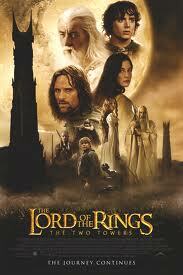 In 2003 this film got an Oscar for The Best Sound Editing and The Best Visual Effects. Got two Bafta Awards which were Best Achievement in Special Visual Effects and Best Costume Design.